I think Chew Yen has a talent for creative hair-do. Her way of hair-styling is outstanding and very sleek. 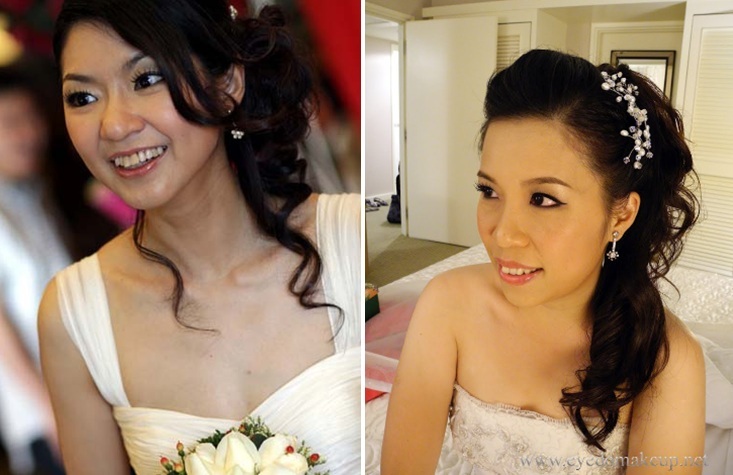 Comments from BTB's (Wedding Acronym) give me the impression that she uses extensive makeup to doll up the brides (comparatively). I can absolutely understand as the stars of the day will be photographed more than any other experience in their lives. They ought to look Label:glamorous and perfectly flawless. She is a believer of enhancing the bride's features with cosmetics to make them stand out. Chew Yen responds to inquiries promptly and you don't have to worry about the communication part. She is also super friendly and bubbly. My impression is her style of makeup is catered for PS, therefore keep the communication open and convey your requests properly, how heavy you want it to be. 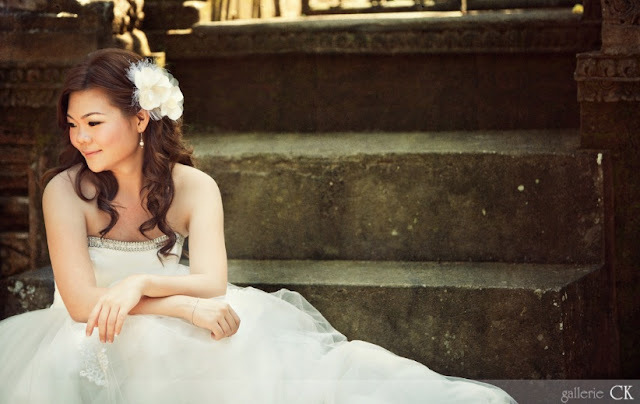 It's not a very accurate assessment if you already look like a model (Yen, the bride in picture above). 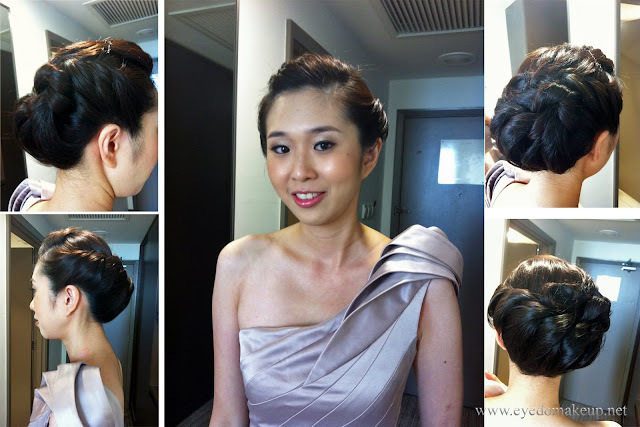 Nonetheless she looks out of this world thanks to hair and make-up executed by Miss Chew Yen. I love it so much that I picked a one-shoulder wedding gown, and a bird cage net to Label:accessorize my Label:hair during our pre-wedding PS. I didn't look as stunning of course :) I was happy with the outcome, I wore my hair down btw. A foreign couple walking pass said I looked very gorgeous.... flattered! Conclusion: Yen is perhaps not that artistic as Angie but she's very experienced. I would still recommend Yen for those who are looking for her style of make up, which makes you look "made up" and flawless, with clean hairdo"
"And I am so glad I found Yen. She is dedicated, freindly, puntual and even humor! 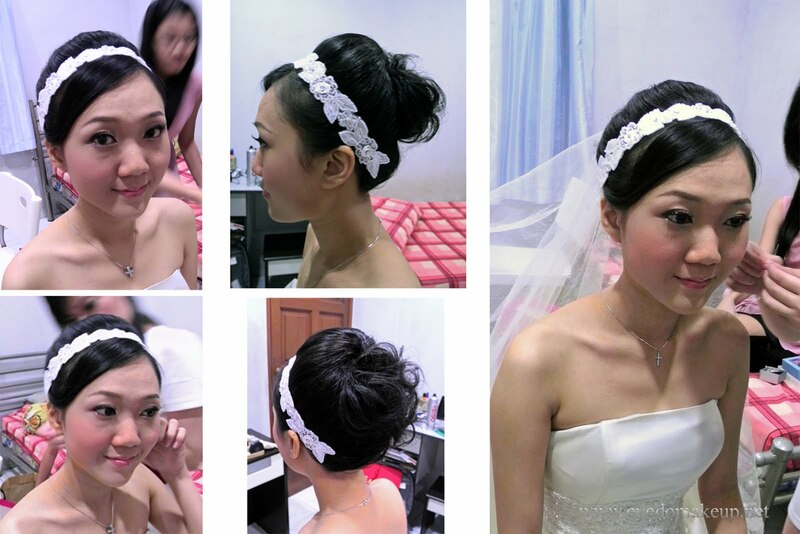 she replies all my queries/ emails/ sms very promptly and give very good recomendation on hairdo and make-up." "I engaged Yen from Eyedomakeup (her name is Chew Yen) for my wedding dinner that's coming in Nov. I have not been made up by her but I'd just like to rave about her good attitude and service! She is very accommodating, replies emails fast, is friendly and gives me the impression that she's all out to please her customers, and is not the 'money face' type of MUA"
"Yen is a friendly & helpful make up artist that I have met. If you are looking for an artist she would be one of those Make up artist I would recommend. "